In Chinese Medicine, many pain conditions are understood to be due, in part, to stagnation of Qi and blood in the area of discomfort. That means oxygen and nutrients that the body needs to heal are not able to reach the location of pain or injury. Cupping is a technique in which a suction-like force holds cups against the skin for several minutes. This treatment promotes increased blood flow to the area of pain and can be quite effective for lingering pain conditions from old injuries such as shoulder pain, whiplash or low back pain. It can also be helpful in relieving symptoms of the common cold. 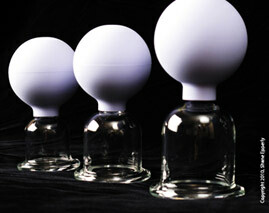 Cupping can leave some marks on the skin which usually go away in a few days. You may have seen round marks on the backs of Chinese Olympic swimmers and divers, these are from cupping! Cupping is not unique to Chinese Medicine. It is a therapy commonly used throughout the world for thousands of years in a variety of healing traditions. These are the cups that are used in facial rejuvenation cupping, a very gentle form of cupping that does not leave marks. These gentle cups are also great to use on children's backs and chests for conditions like asthma, and cough.